The beauty in Babak Rashvand’s paintings. Babak Rashvand might be called a Persian Calligraphy Painter but he has his own style. 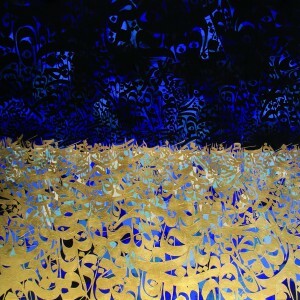 However, how is Babak Rashvand, a Persian Calligraphy Painter, who develops his own style? It is noteworthy that the central meaning of Babak’s artworks are the letters, which create the words that express the above feelings. However, his exceptional input in the so-called Persian Calligraphy Painting is the elongation and the distortion of the letters, which become abstract forms. These could be seen as personifications of freedom and universality as letters, by losing their standard format, become free from any connotations. There is no country of origin or a certain vocal sound reminiscent of Rashvand’s artworks. On the contrary, the works can be seen as a dance and a homage to the eternal and universal language of music. As Nitsche said: “Without music, life would be a mistake”, and “Those who were seen dancing were thought to be insane by those who could not hear the music” ³. Therefore, my wish is that we will all “listen” to Babak Rashvand’s music and dance as we read this catalogue and while gazing at his amazing artworks during his first London solo exhibition. Maria Migadi curated the first London solo exhibition of Persian artist Babak Rashvand in Gallery 8 in St. James in London from Monday 26th to Sutarday 31st October 2015. The show was organised by Bahar Abdi with the sponsorship of Small Media and the support of Martix, Carpo and Bottle Green.